International Nano Letters is a peer-reviewed open access journal published with SpringerOpen, covering fundamental and applied research in all disciplines of science, engineering and medicine. It is fully supported by the Islamic Azad University, who provide funds to cover all costs of publication, including the Article Processing Charges (APC’s) for all authors. Therefore, it is both free to read and free to publish in International Nano Letters. 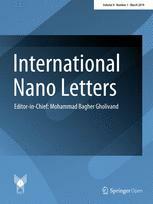 The overall aim of the International Nano Letters is to bring science and applications together on nanoscale and nanostructured materials with emphasis on synthesis, processing, characterization, and applications of materials containing true nanosize dimensions or nanostructures that enable novel/enhanced properties or functions. It is directed at both academic researchers and practicing engineers.